Vietnamese cuisine is known for its fresh ingredients and distinct regional flavours. I had the pleasure of sampling many of Vietnam’s culinary delights during my holiday to Vietnam this past summer. 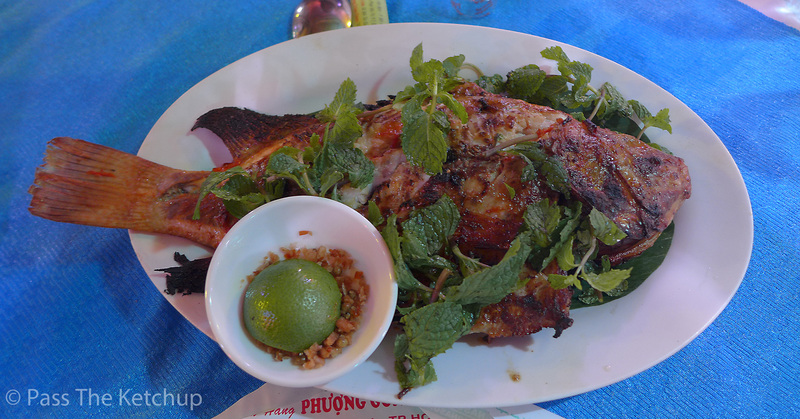 If you are planning a trip to Vietnam, here is a list of the dishes that you cannot afford to miss during your visit. 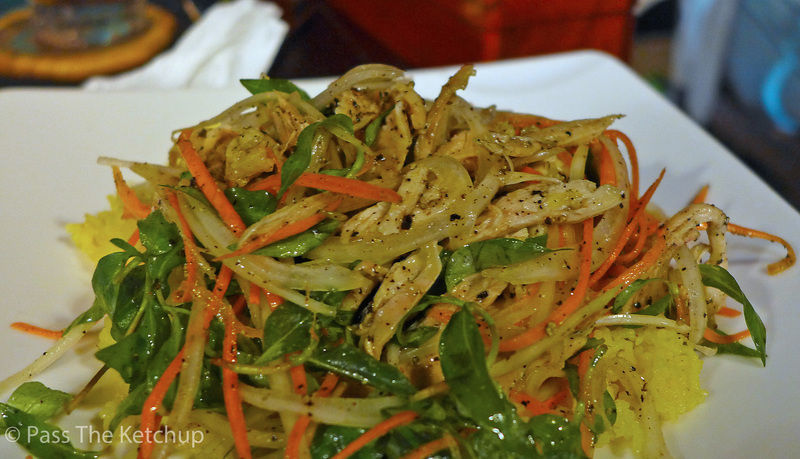 Prepared using shredded unripe papaya, Gỏi Đu Đủ’s combined ingredients result in a perfectly balanced salad. This delicious appetizer is crunchy, sour, sweet and refreshing. I should note that Gỏi Đu Đủ is normally topped with crushed peanuts; I had it served without nuts due to my allergy. 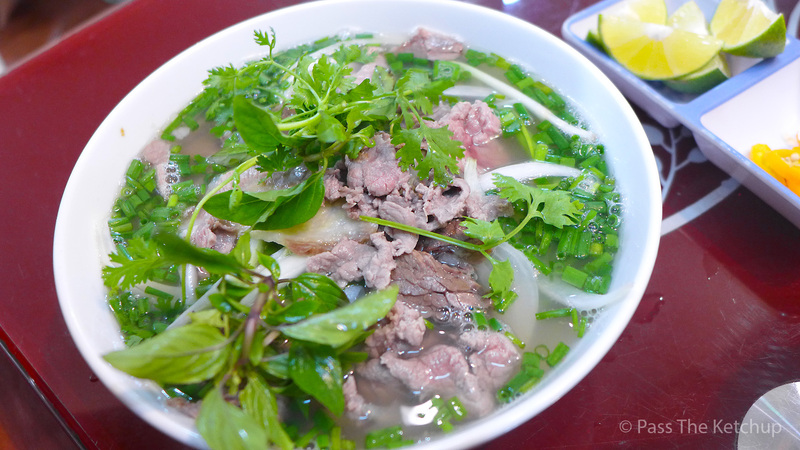 Served at any time of the day, I often had Phở (pronounced pher) for breakfast. Phở is probably the most well-known Vietnamese dish in the world and yet it is so simple in its construction. A bowl of noodles is filled with hot broth, vegetables and beef or chicken. It is always accompanied by a plate chillies and lime for flavour customisation. Cost: 40,000 VND (approx £1.40). You cannot walk very far in Vietnam before coming across a street food vendor. One of these food stalls will most definitely be grilling fish and other seafood on a barbecue. You can choose your fish and the chef will grill it to order. Popular varieties of fish include red snapper and bream. Cost: 215,000 VND (approx £7.70). 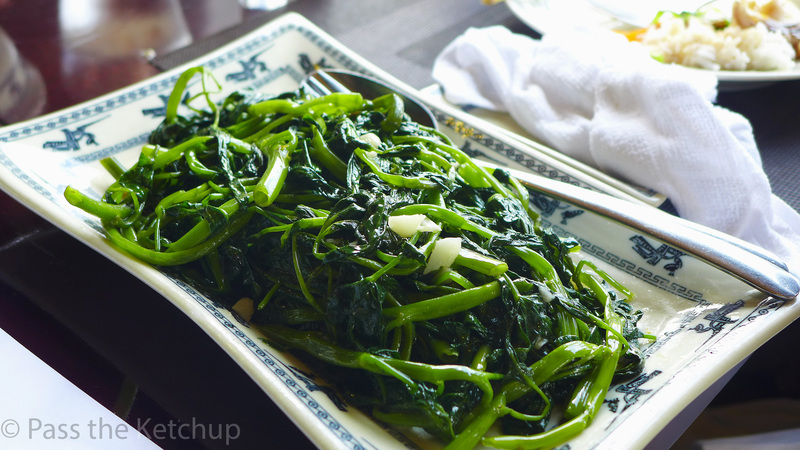 Available in abundance and very cheaply, Rau Muống is a water spinach that is cooked throughout South East Asia. In Vietnam, Rau Muống is stir-fried with garlic and fish sauce. It is so good in fact, that I have started cooking it at home in the UK. Cost: 30,000 VND (approx £1). Brought to Hoi An by Chinese traders, Cơm Gà is prepared by cooking rice in chicken broth and topping said rice with mint and moist shreds of chicken, coated in black pepper. I would say that Cơm Gà has many similarities to Singaporean Hainan chicken rice. Vietnamese food commonly has clean, simple flavours, which is why I found the taste of Cơm Gà suprisingly different to much of what I ate while in Vietnam. Cost: 50,000 VND (approx £1.50). Packed full of fresh herbs and lined with prawns, not only are these rolls beautifully presented, they are bursting with flavour. Despite the majority of this side dish being compromised of vegetables and rice paper, these rolls are quite filling. I would recommend sharing them with a friend! Bún Thịt Nướng Chả Giò is a street food meal that can be picked up quite cheaply, anywhere in Vietnam. 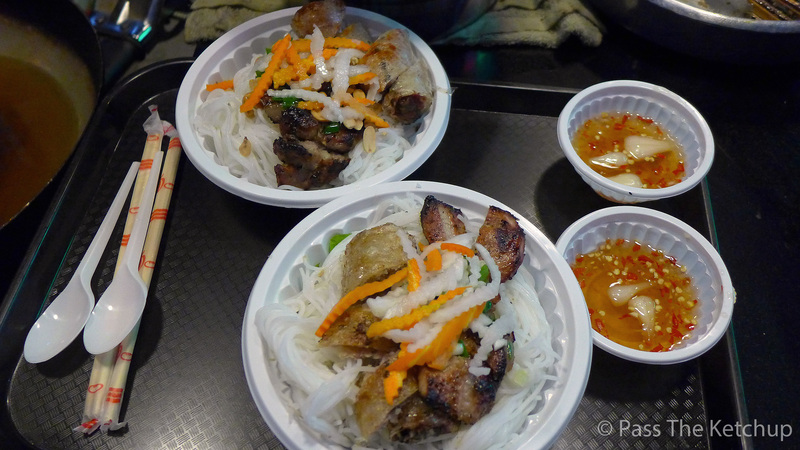 A bed of cold vermicelli rice noodles are topped with grilled meat, spring rolls and salad. Cost: 60,000 VND (approx £2.00). Nuoc cham isn’t really a dish but deserves an honourable mention due to the fact that many Vietnamese meals would not be complete without a side of this dipping sauce. It is sweet and sour fish sauce that complements many Vietnamese meals. I would gladly drink a glass of this stuff. You can see it in the white ramikin, in the picture above. Cost: 0 – it is provided free of charge with most meals. Ho Chi Minh City: Ẩm thực Hai Lúa (aka Nhà Hàng Hai Lúa). We went to the pop-up restaurant in a marquee, outside Ben Thanh market. They do, however, have a permanent addresses here: 18 Phan Văn Trị, Phường 7, Gò Vấp, Hồ Chí Minh and 648, Nguyễn Trãi, Phường 11, Quận 5, Tp. Hồ Chí Minh. Have you been to Vietnam before? 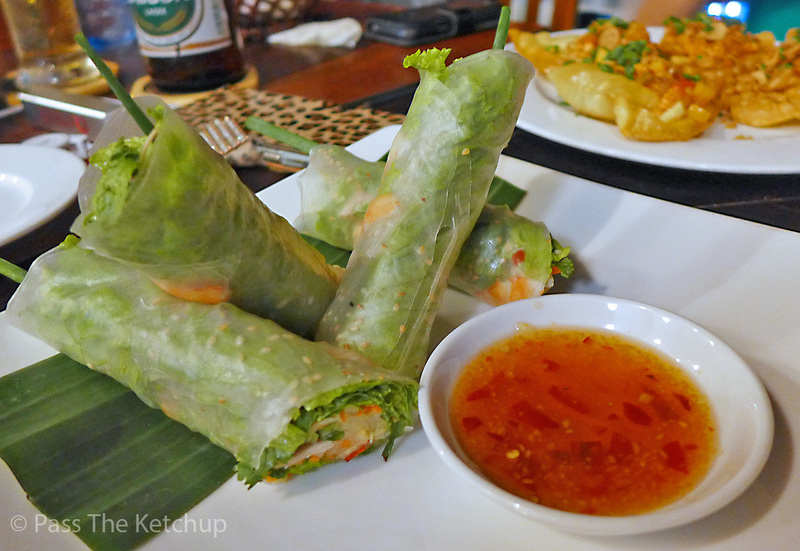 What were your favourite Vietnamese dishes? Let me know in the comments below.